The Asus Eee PC range was the first ever netbook range to hit the market and it has grown in to a sprawling line of netbooks since. The ASUS eeePC 1015PW-MU27-PRis a 10inch netbook that comes in multiple colors. This is the purple version. Powered by an Intel Atom N570 1.66GHz processor, this netbook comes with 1GB of DDR3 RAM (Single slot, Expandable up to 2GB). This is a dual-core Atom powered device, which makes it really good mult-tasking for basic things like running multiple browser tabs and listening to music at the same time. Coupled with the DDR3 RAM, it should be able to handle pretty much everything that you throw at it. Packing in a 10.1inch LED backlit display, this netbook has a native resolution of 1024 x 600. It is the standard resolution for this screen size and is just right for comfortably reading text and viewing images and videos. The graphics is handled by an onboard Intel GMA 3150 chip, which is enough for viewing standard definition videos both online and locally. 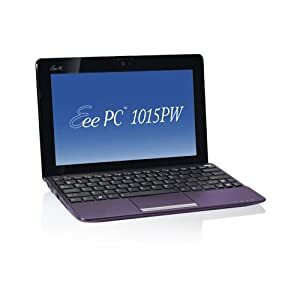 The main attraction of this netbook, other than the affordably price point and stable performance, is the purple styling. Being one of the latest generation models, it has sleek looks with a smooth matte finish. The lid has a textured design in purple with the Asus logo on it. The bezel is shiny black with the webcam on usual the top center spot. Asus has added a physical on/off switch for the webcam right above it. The ASUS eeePC 1015PW-MU27-PR comes a 250GB SATA HDD for storage and also has a memory card reader on the side. So now you can carry this around on your trips and instantly transfer all your digicam photos from the. The keyboard covers all the available space on the netbook and has island style keys that make for comfortable typing. The layout ensures that no space is wasted. The touchpad is fused in to the palm-rest and has the same finish as the rest of the region. It is demarcated by two vertical silver accents that are set in to the body. The lower ends of these lines terminate over the single click bar that has a slightly curved design and a silver matte finish. The touchpad performance is average might take some time getting used to. With a 6-cell battery, it has an official battery life of 10 hours. In real life scenarios you can expect it to last around 7hours with with abundant WiFi usage. There are 3 USB ports on this netbook along with 1 VGA port and 1 Ethernet port. There’s WiFi b/g but no Bluetooth. It comes bundled with Windows 7 Starter Edition, which is a bone of contention for a lot of buyers. However, its limits can be gotten around by using third party solutions that are freely available online. Over all, the ASUS eeePC 1015PW-MU27-PR is a good buy for the price point, especially with the dual core performance and the good looking styling in place.